The new build system which was introduced in Visual Studio Team Services (VSTS) and TFS 2015 has been gaining more popularity lately, and (in my opinion) rightly so. It simply works far better than the old XAML builds. I’ve been converting quite a few XAML based builds to the new build system. While doing this, I (inevitably of course) came across quite a few custom build workflows and tasks. Some of these were easily converted to build tasks that are available out-of-the-box, while others required some custom tasks. When creating a custom build or a custom build task, you’ll at some point need some build-specific information. This is where environment variables become necessary. Since I wasn’t too familiar with the concept (I’d heard of them, but never really used them) I decided to dig a little deeper. Environment variables are a concept within the operating system. They are a set of key-value pairs which are specific to the environment of your current process. The use of environment variables is well known on most operating systems, such as Windows, Linux & Mac OS X. This makes them very useful in cross-platform scenarios, such as a build agent. Some examples of common environment variables are “PATH” (a list of directories to search for a command you’re executing), “TEMP” (the path to store temporary files) and “WINDIR” (the path to the Windows installation directory). In the context of a build job, the current process will be the execution of your build definition. So, any environment variables created in this context are available to all the tasks in your build definition! 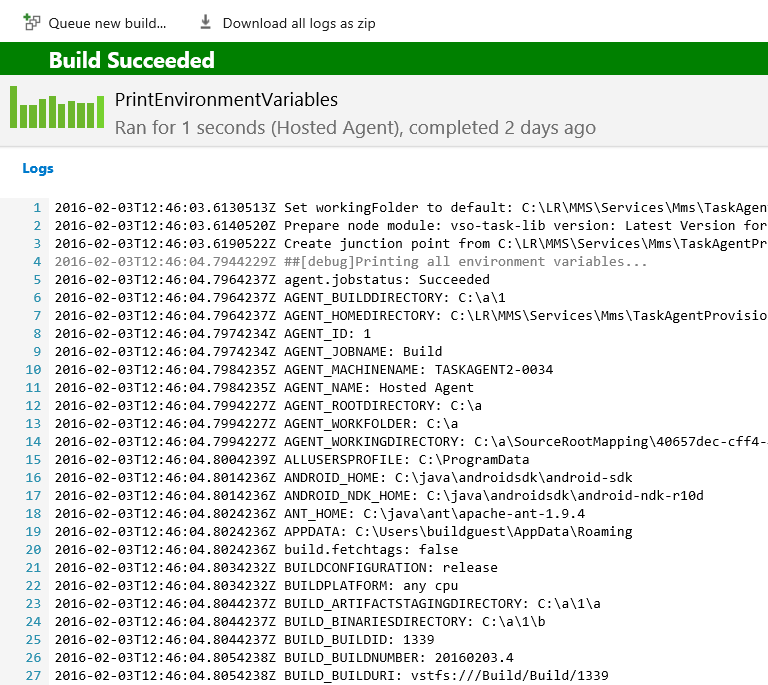 This means that you can use environment variables inside your build tasks to control the execution of the build task. Also, you’ll be able to pass information from one task to other tasks downstream in the build process. The build definition: any variables that you set on the “Variables” tab in your build definition (either in the definition itself or when queueing a build) will be available as environment variables in the build job. You could put this inside the code of any custom build task that you’re developing. However, I decided to wrap this in a small custom build task that will print all environment variables and their corresponding values. This will allow for easy debugging by just including the task anywhere in your build process. You could even include it multiple times to see if and how any environment variables were changed between tasks. The code for this task can be found on GitHub. Feel free to use it! Hopefully this will help you to understand what’s going on in your builds. I created a variable “revNo” to set revision number of our build. This number is build number of another build. So I created powershell task where it fetches the value and updates “revNo”. It works within powershell command once it moves to next ask, the value is lost. Any suggestion on how to hold on the value till build is completed?